Why Does My Sink Back up Whenever the Dishwasher is Running? Coming home and finding your sink filled with the water from the dishwasher is very unpleasant and inconvenient. The water from your dishwasher drain and your sink flow through the same drainage line. So, any clogs or blockages within that main drain line can cause water to back up and overflow. If this is a reoccurring problem, occasional maintenance and simple cleaning may be your answer. If standing water is covering the bottom of the dishwasher, it is not draining correctly. Check to see if anything is covering the drain in the rear of the dishwasher. You may also check to see if there is a kink in the drain hose. Does your sink have an air gap to prevent dishwasher backflow? If it does, that may be the cause of the problem. If the air gap is blocked, water flows from it when the dishwasher is running. 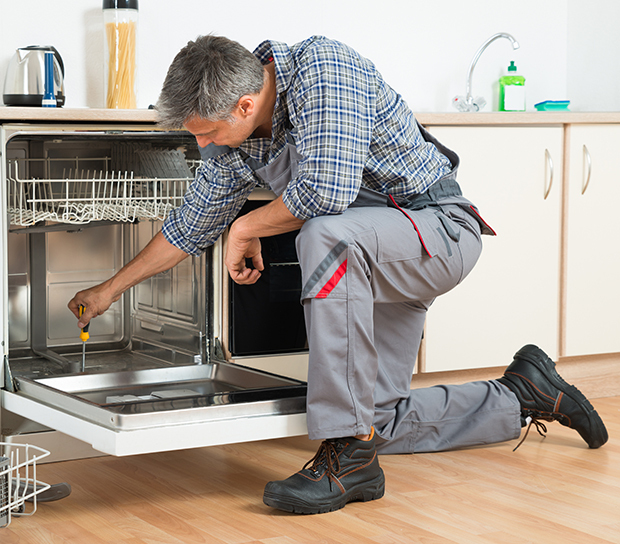 While you worry that your dishwasher may be the source of the problem, it may turn out to be your kitchen sink after all. If food scraps and debris are blocking your sink, it causes a water backup that is worsened when your dishwasher is running. Another unlikely culprit is your garbage disposal. If during installation, the garbage disposal’s drain plug cover is left on, it will restrict the outflow of water from your kitchen sink or dishwasher.